This is a continuation of a travel series to South Dakota. To start at the beginning, go HERE. The rest of the posts in chronological order are HERE, HERE, HERE, HERE and HERE! In last week's travel post, I showed two waterfalls in Spearfish Canyon, South Dakota. 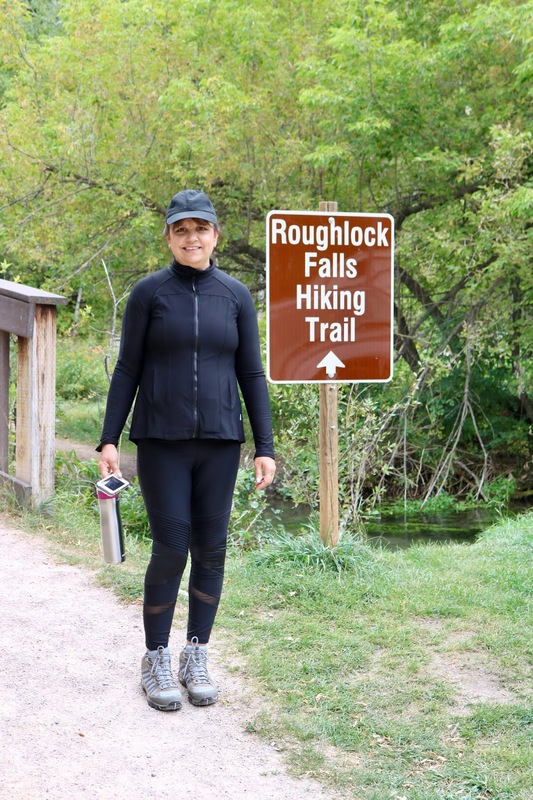 This week I'm sharing the third one we visited: Roughlock Falls. 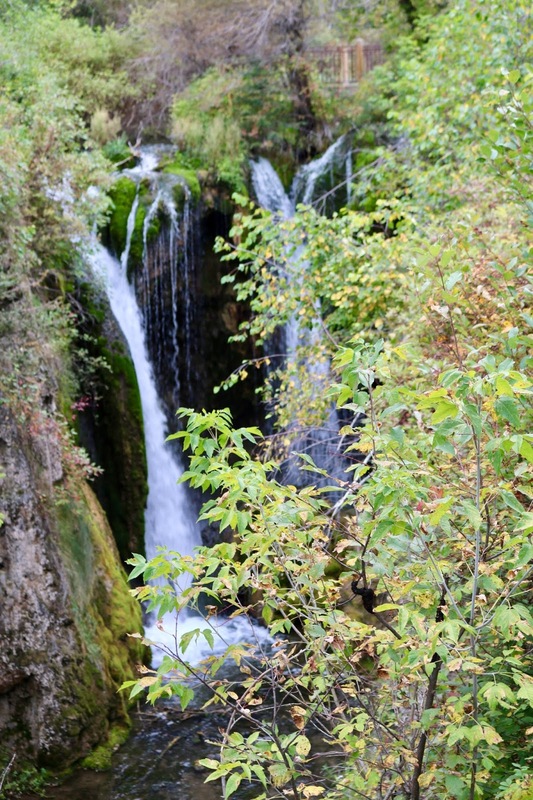 Roughlock Falls is a multi-tiered water fall that is so charming it looks like it belongs in a Tolkien story book. I kept waiting for the fairies and other creatures to pop out from behind all the green moss. The unusual name of the falls come from the pioneer days when pioneers traveling down the canyons use to lower their wagons down the drop by rough locking their wheels to prevent them from rolling away. 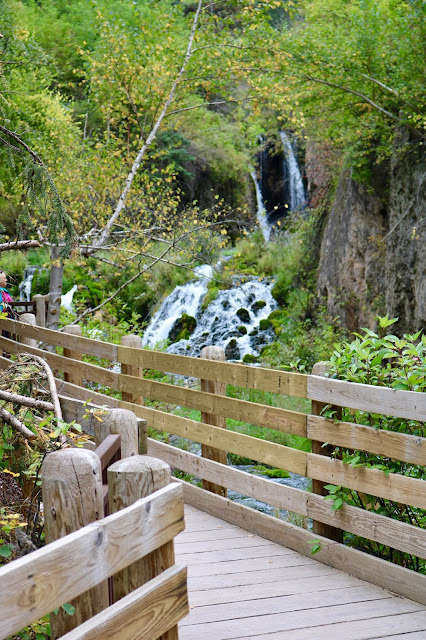 You can get to the falls by hiking the Roughlock Falls trail which is located right behind Spearfish Canyon Lodge. It is a lovely one mile (one way) hike. You can also get to the falls by driving a gravel road and hiking a short distance from the parking lot. Of course, my husband and I chose to walk. We were surprised at how almost everyone but us drove to see the falls. My, the beauty they missed! 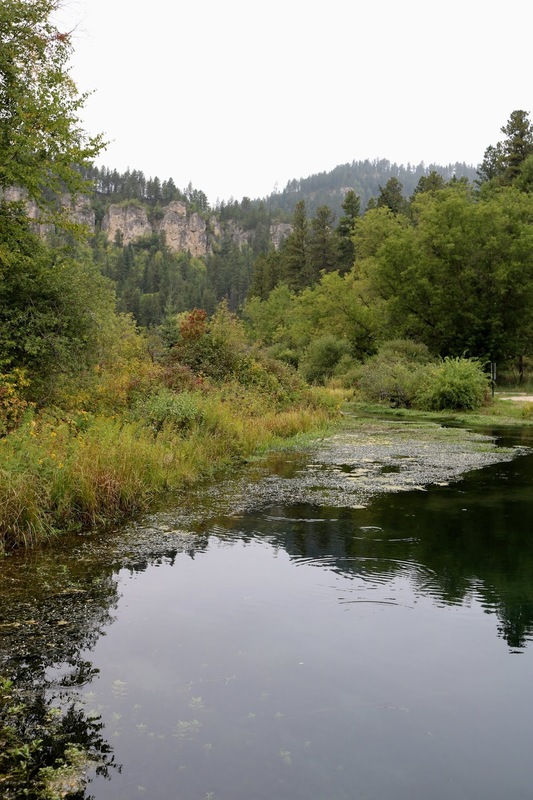 The trail gives you beautiful views of the canyon walls, and you also pass a large pond with water so clear you can see the fish! 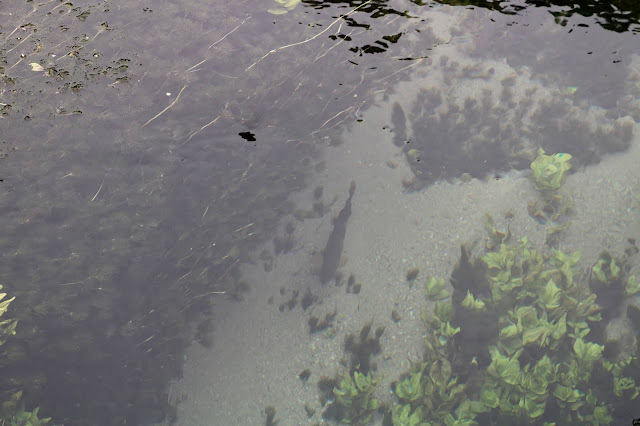 There is a bridge over the pond that you can walk out on to see the fish. I couldn't believe all the fish in this pond! 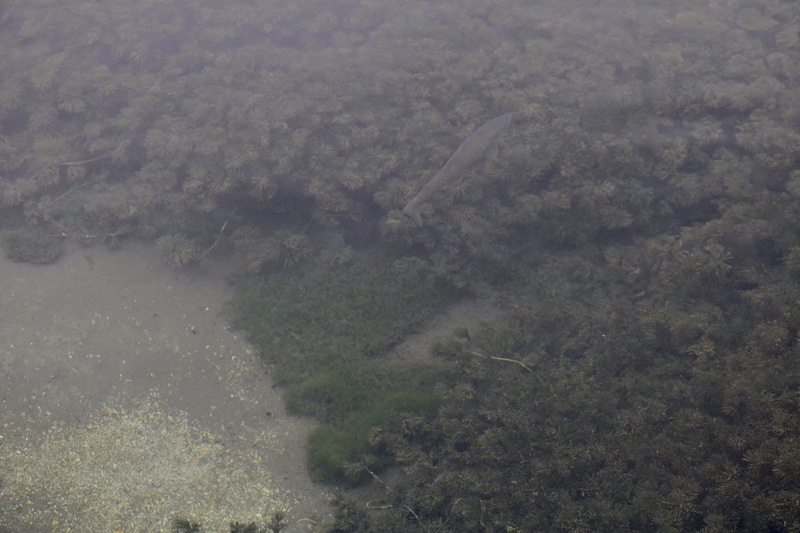 Do you see the fish in the pictures below? Most of the path is a dirt path through the forest, but eventually you get to the civilized part, where the other hikers who cheated and drove up to the falls will now meet up with you. 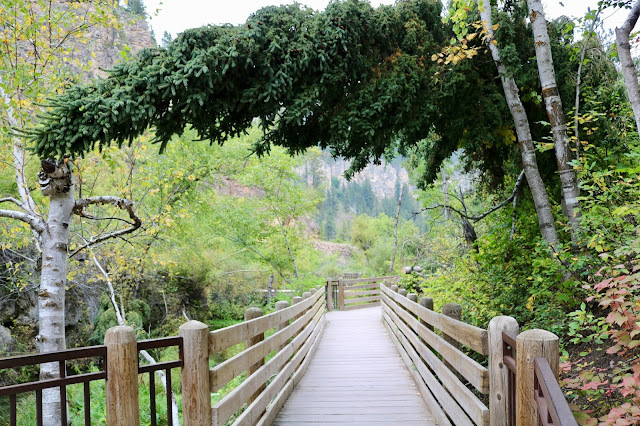 Here is a boardwalk leading to viewing decks of the falls. I loved this pine tree bent over the path. The falls are truly stunning to see. 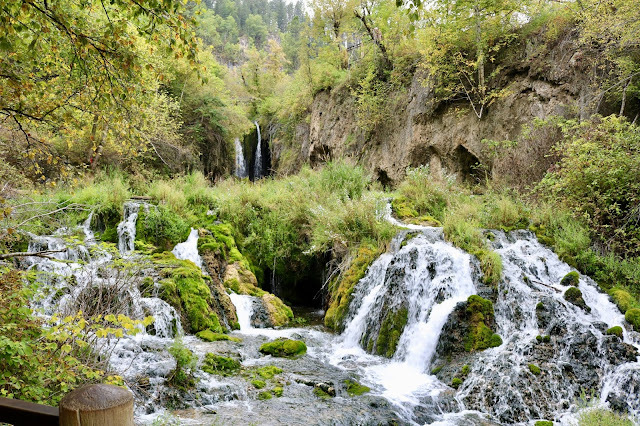 The falls is created by Little Spearfish Creek. 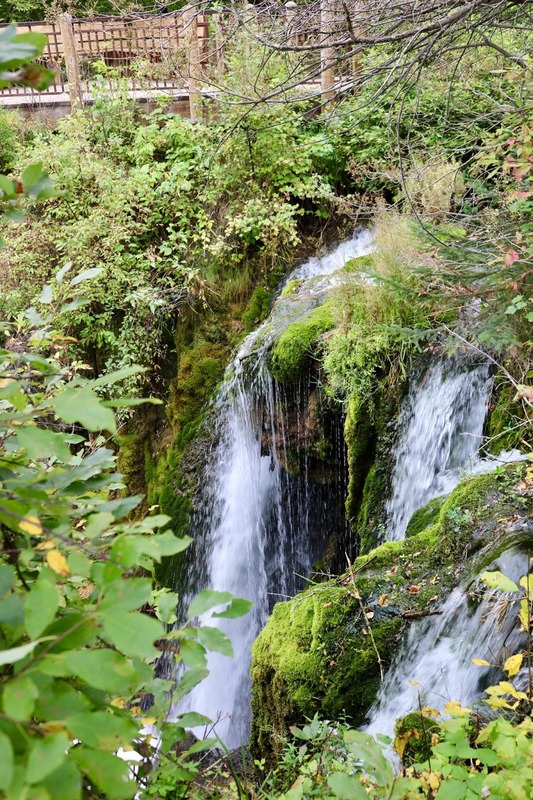 The creek falls down a spectacular chasm, then tumbles down fifty feet in a series of lacey cascades. To me, that was the most beautiful part, the "lacy cascades". It was just such a magical and beautiful falls. The green moss covering all the rocks surrounded by water was just so pretty! After our hike, I was tired and cold, and I so badly wanted a nice hot cup of coffee, tea, or hot cocoa, so we stopped at the Latchstring Restaurant to warm up and relax a bit. But all they had to drink was plain black coffee and I was really in the mood for a fancy coffee drink. So, I ordered a bowl of Buffalo Stew instead. I never had buffalo before and I wanted to try it. It was a little tougher than cow beef, but it was good. After my nice hot bowl of Buffalo Stew, we got back in our car and drove to our next hotel for the night. The town had a small movie theater, so after dinner we decided to relax and see a movie. The theater had reclining seats, I can't tell you how good it felt to recline back and relax after a long day of hiking! Or, maybe my husband can tell you how nice it was. :) A picture is worth a thousand words! And that concludes Day 3, Spearfish Canyon. 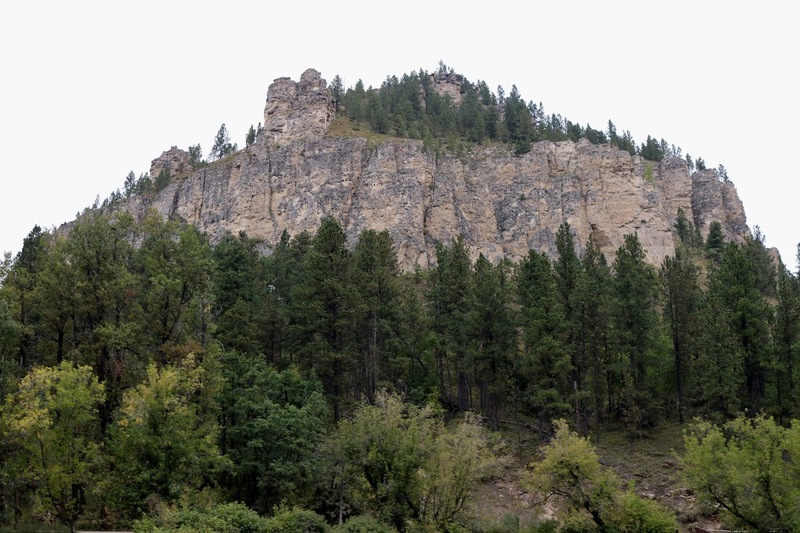 Next week I'll start Day 4, beginning with a stop at Pactola Dam & Reservoir. The falls were so pretty- you guys hiked like champs! That looks like a wonderful place to hike!! The hike and falls were so pretty! What a gorgeous scenic place to visit! Thanks for visiting Laura. It was gorgeous! Thanks Ellie! I ALWAYS get nervous hiking in states where I know there are more dangerous animals than we typically see in Wisconsin. I hate it, because it ruins my enjoyment of the hike. We want to go to the Tetons soon, but I hear so much about the grizzlies, I'm terrified. We're thinking of taking a guided horse back trail ride through the tetons instead of hiking alone. Such a beautiful area and I'm sure you enjoyed hiking but also relaxing after a long day. Thanks for sharing your photos with us at #MLSTL. Thank you, yes, it was nice to relax. Most people don't go to movie theaters on their vacation, but we had the time so why not? I think that movie/rest at the end was well deserved! 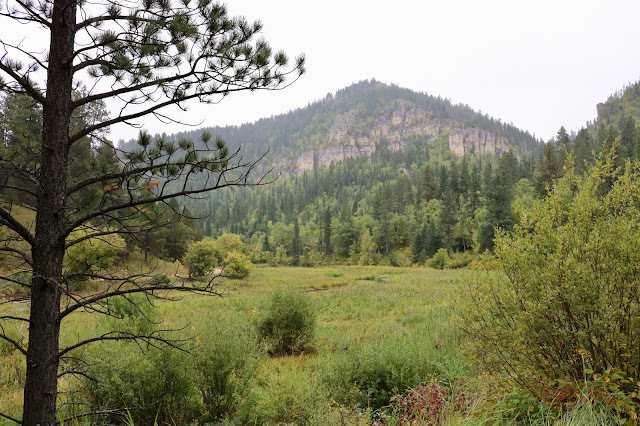 Fantastic scenery and great that you could get out and hike some of it. So lovely place!! i hope you had fun! Yes, we did! Thank you! Thanks Christie! It was beautiful! I’m so ready for spring after the Polar Vortex we experienced this week. Thanks Nick! The stew was pretty good, however, I was chilled from hiking that anything hot would have tasted good! ha ha!